"Most of us know 'senior saints,' and upon knowing some of them we have thought, 'Remind me not to act like that as I get older!' Well, Jacki Martin explains how, by God's grace, to honor God, even in the challenges of aging and loss. God's Path to Golden Splendor is a wonderful book for any Christian who desires to love God and love others up until the very last day God has given you on earth. I loved reading this book and I highly recommend it!" 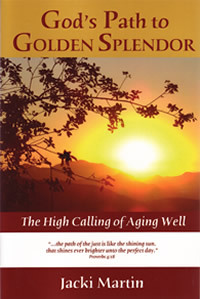 "As I read God's Path to Golden Splendor I often was reminded of attitudes that I need to remember in my walk with the LORD. It is excellent advice on growing old gracefully, plus ...start NOW! is like the shining sun that shines ever brighter unto the perfect day."